Durasow has prepared three stages of this intellectual duel. Following a White Rabbit into a hole is just the first one, as the reader shockingly enters a land of well-known personas. Interestingly, Games with the Dead hardly resembles a hall of fame or a history lesson. Stripped from their original context, the eponymous characters of each poem undergo a lyrical though brutal dissection. Starting from ‘The Aubrey Beardsley Colouring Book,’ the speaking persona alludes to a biography of a famous Art Deco artist. Painting it with vast smudges of words, “the algal bloom” (p. 17) is visualized on a par with “a head if you’re bobbing for apples.” This constitutes a rather disturbing imagery. In a subtle way, it merges Beardsley’s black-and-white acts of creation with colorfully disturbing visions of the acts of violence. A poignant vision of death, terrifying in its intimacy, can be observed in ‘Regina Lisso,’ a verse named after a 21-year-old member of the German Red Cross service who committed suicide at the closing phase of the World War II. Hailed “the very pietà the Third Reich” (p. 24), she is depicted as both—an object of veneration and desire. The speaking persona acts as a votary of sorts, who is simultaneously confused and honored by the presence of Lisso’s inanimate body. The moments of reflection are intertwined by musings upon the darker side of human nature. The clash with darkness may take a turn into a more down-to-earth dimension. In the three-part poem, ‘Prayer to Anakin Skywalker,’ a reflection on the consumerist perception of the movies, depicts a shift from the metaphysical context into a more mundane one occurs. Starting from the character’s story of “a little boy, dog-happy in the loaf-thick snow” (p. 29), the poem juxtaposes Anakin’s narrative (and the viewer’s child-like impersonation with the character) with “[t]he force of greater numbers and budget g-hardened” (p. 30). The awareness of technicalities and costly special effects permeates the reception of a Star Wars plot indicating the presence of the two worlds: the fictional universe of the Force capitalized and the force of consumerism with all its gadgetry (“popcorn is critical”) (p.30). The clash of sacrum and profanum remains at the heart of the poem, proving that the battle taking place in the story intertwines with the emotions of the viewer aroused by what defines the modern cinematic experience. The audience of the 21st century craves a game of violent impressions, and so do the readers of Durasow’s collection. The expectations of both parties are soon to be satisfied in the ‘Prayer for Edward Kenway.’ Being a true “seminar of butchery” (p. 21), the poem is dedicated to a fictional character of the Assasin’s Creed IV universe. Similarly to the ‘Prayer to Anakin Skywalker,’ Durasow chooses to place a fictional character among historical figures equalizing the ‘real’ world with that of the (in)famous works of literature, television and the digital universe. Mixing images and people in such a manner serves as an entrée into a playground in which the reader is offered to take as many moves and maneuvers as they like “at [their] bookcase” (p. 21). In the further verse, Durasow proves that being engulfed by the game with the world of fiction, or fictionalized world of reality is equal to “tak[ing] an Odyssey” (p. 21). Surprisingly, the marriage of reality and the fantastic makes the presence of the latter more perceptible. It is characteristic of Games with the Dead to contain a few poems starting as ‘Prayer for …,’ yet the element of sanctity, if extant at all, is thwarted at best. A similar fate befalls the poems entitled ‘Love Poem …,’ which, instead of expressing sentimentalities toward the object of love, fuses a desire to dismantle. Special attention should be paid to ‘Love Poem for Ellen Ripley’ which, told from the point of view of the famous Alien, reveals his eroticized urge to tear Ripley apart. what an intermittent blip looks like in the flesh. Steamy and burning, it speaks the words of caustic lust intertwining with the consumptive urges of film production. Drastic and fleshy, Games with the Dead proves that death and violence are in high demand in all form of popular culture. History, literature and the digitalized world feed on cruelty that dons tantalizing outfits. While presenting the power to dazzle and paralyze, the section does not lose its lyricism, evoking a reflection on the phenomena that were otherwise invisible to the naked eye. A blood types shouldn’t eat meat. This and other factoids one overhears on the lash. Did you know eighty percent of men cry in their cars? A written act of gambling with the FACT organization being boldly confirmed by the speaking persona’s challenging boast concludes the poem. The final installment of Endless Running Games—Games with the Living offers the most intense reading experience. The opening work, ‘Poem for testing your vision,’ welcomes the reader with a clash of ideas. Starting with a praise of nature (“Now we have reached the trees—the beautiful trees!”) (p.51), it immediately tears the veil of stereotypical expectations. Experiments with form and content follow boldly in ‘For Street Fighters’ which introduces arrow signs to emphasize the dynamism of the game. A true challenge arrives with the ‘S mpton s f th ime ancer’ whose message can be deciphered once the reader uncovers the missing letters in almost every introduced world. 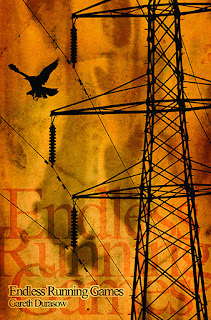 As the levels of the games played with the reader differ in complexity, one may encounter poems that are not based on a riddle in the technical sense; such works as ‘Elseworlds #1,’ ‘From a Prospective Russian Bride’ or ‘A Guide for Aspiring Blade Runners’ are more subtle, blending the well-trodden ideas to add a new quality that opens up new vistas of perception. The poem ‘She waits in Google’ remains the greatest masterpiece in this domain. Through the application of the random arrangement of Google listings starting from “she waits” or “and now she”, the speaking persona builds up a coherent text depicting the birth of love and its decline in the digitalized world. Contrary to ‘She waits in Google,’ its twin poem, ‘She waits in IMDb.com,’ operates with images from movies, which, like a camera, record scenes that playfully dance on the thin thread between fiction and reality. The closing poem, ‘TRIHAYWBFRFYH,’ whose title is, in truth, an acronymized version of the verse “The Rapture Is Here/ And You Will Be Forcibly Removed From Your Home” (p.71), presents the finale of human existence. It proves that while a game (The Rupture, or any other game) is exciting, the gravity of life should not be subject to the distraction offered by popular culture. Play and overexcitement end as the speaking persona realizes there is “So Much Out There We Can Stroll Towards/In Our Own Time,/ At Our Own Pace/ On a Day Like Today/ But Without The Rapture” (p.71). Ending the last section of Durasow’s Endless Running Games one cannot resist the temptation to exclaim “Game Over”. This, by no means, points to the end of creation as the new games will start once this adventure comes to an end. Lyrical, ethereal and estranged, Endless Running Games is a book that reveals a wide array of hidden meanings allowing the reader to uncover new ones with every reading. A bit fast-paced and perplexing at times, the collection of poems introduces innovation of form not for the sake of estrangement alone, but to convey a message depicting a variety of metaphorical games played at various levels of our existence with or without our awareness. A pleasure and challenge combined, Durasow’s book is a perfect tool to broaden one’s perspective on the meaning of life and fiction and savor the delights of the so-often-undervalued subtleties of speculative poetry.